I always get excited when I receive my issue of Cooking Light in the mail, and this month was no different! As soon as I got back to my apartment I flopped down on the couch to flip through pages of delicious looking recipes. My monthly issues of Cooking Light always ends up looking a little worn and ragged with a million recipes "dogged eared" in the hopes that I will someday make them! There is no doubt that the first place I turn for healthy recipe inspiration is Cooking Light. Yesterday, as I was pondering how to use the rest of my Rotisserie Chicken (which was an impulse buy for my Moms Pasta and Veggies with Olive Oil) I found inspiration once again in the pages of my Cooking Light Magazine. The recipe that sparked the creative wheels was - Spicy Thai Basil Chicken from Cooking Light. So armed with my leftover Rotisserie chicken I set out to experiment in the kitchen! 1- Heat 2 Teaspoons Oil and Sautee your minced shallots for 2 min. Add your red pepper and continue cooking for 1 minute. Finally add your garlic and sautee for 30 seconds. 2- Add your soy sauce, serrano chilis, brown sugar and black pepper in with your shallots mixture. 3- Slowly add your shredded rotisserie chicken handfuls at a time, and cook on low till the chicken is heated through. 4- Remove chicken from heat, and stir in chopped basil and lime juice. 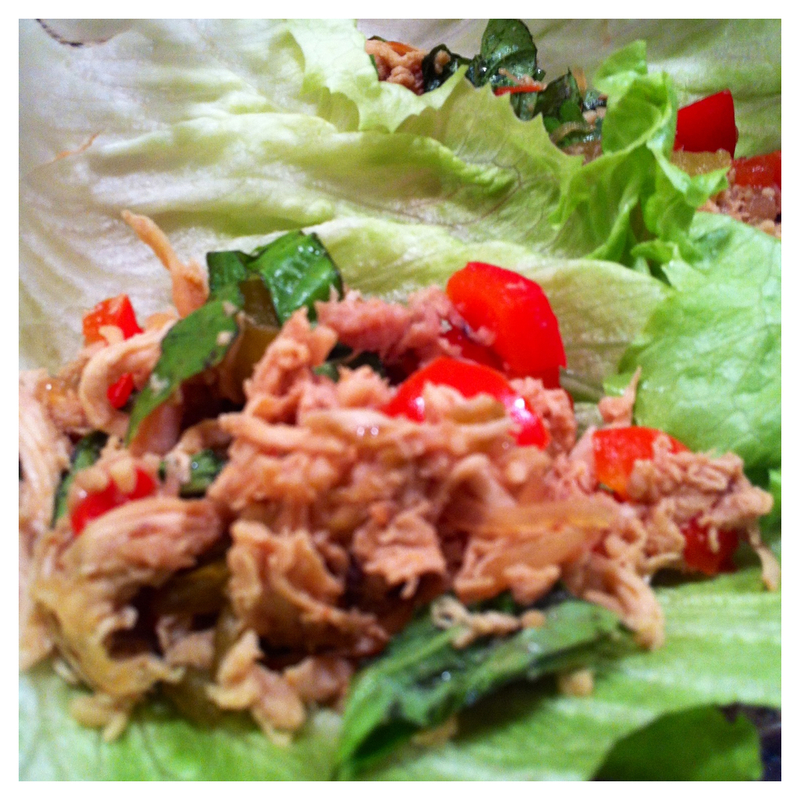 Serve along side Sesame Rice and some lettuce leaves for wrapping! I just saw your news about Cooking Light- congrats thats so exciting! I love that magazine as well. This recipe looks delish! I LOVE Cooking Light. My favorite! Cooking Light is such a good magazine! Sounds like a great recipe too.